Shop Scouter is an advertising-supported program that belongs to a new family of Shopmania adware applications. You should remove this app because it is designed for third-parties to display advertisements on your browser, thereby spamming your browser with commercial content. Even if you a seasoned shopper, you will not find this adware app as indispensable to your computer experience as it wants you to believe. Compatible with all the popular Internet browsers, the moment Shop Scouter enters your system, it manifests itself as a pop-up window in the upper right corner of your screen. If you do not want to be bothered by this distraction, which is unlikely to suggest any relevant information, follow our instructions below to delete Shop Scouter from your system permanently. In fact, it has already been noticed, that Shop Scouter is identical to ShopzyApp, Price Wagon, PriceExpert, and other new apps, which have started circulating on the Internet. What makes this application even more dangerous, and thus you should remove Shop Scouter from your machine, is the fact that at the moment it reaches target computers bundled with malicious installers. So, if you do not want to upload PC Optimizer Pro, MultiPlug or SuperWeb, and other infections, to your system do not download content from suspicious software distribution sites. 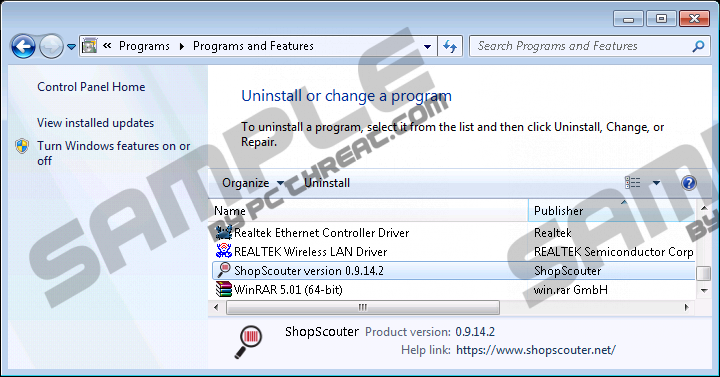 Therefore, if you did not get Shop Scouter directly from its official site shopcounter.net, check if there are not any additional unwanted applications in the program list of your system and delete them immediately. If you are not a shopper and suddenly started seeing pop-ups, banners, in-text ads, and other commercial content, you will probably want to terminate Shop Scouter from your computer. Even if you want to keep it, bear in mind that the moment you install this app on your computer, it starts collecting marketing-related data to shape its services. Though it might seem complimentary that Shop Scouter scans your online preferences in order to provide you with the best shopping offers, we still recommend that you remove this app, because it is too unreliable an application to be allowed to engage in such activity. What is more, the content might not always seem reliable because the app can be easily exploited by malicious third-parties to lead you into the unmonitored sites that contain malware infections. We encourage you to remove Shop Scouter because the damage this app might cause to your computer can outweigh all enhancements this application promises to bring. Luckily, the removal can be performed from Control Panel; however, if you are a user of Internet Explorer, you will need to get rid of the app from the add-on manager. As Shop Scouter is known to spread with other dangerous infections, install reliable antimalware software that will scan and remove all the threats that might be plaguing your system. Open the Charm bar at the bottom right corner of the screen. Choose Settings and go to Control Panel. Choose the application in the program list. Open Control Panel, and then click Programs. Choose Shop Scouter in the program list. Select the program you want to delete in the list. Press Alt + T and choose Manage add-ons in the Tools menu. Select Shop Scouter in the Toolbars and Extensions section. Quick & tested solution for Shop Scouter removal.